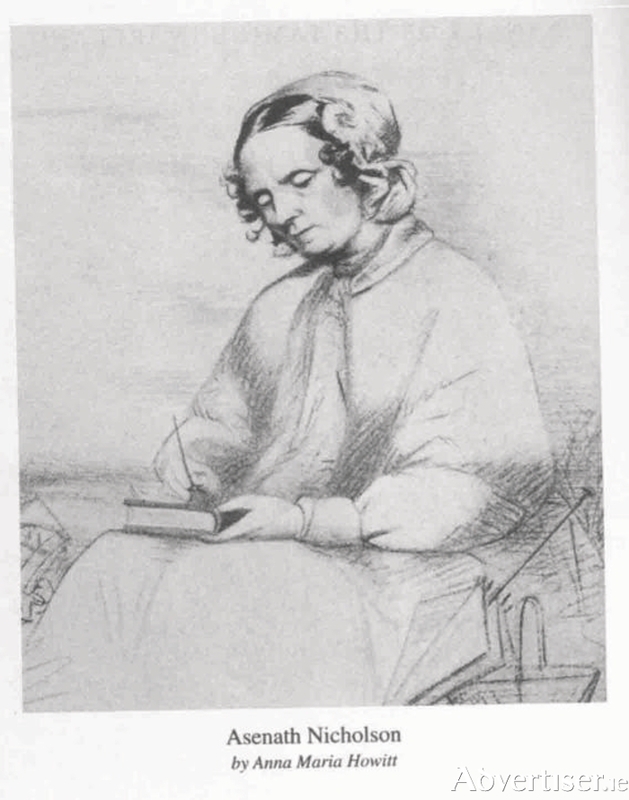 Aesnath Nicholson, writing her journal, as she walked through Ireland during the Great Famine of the 1840s. During her first visit to Ireland while walking the road from Oranmore to Loughrea, Aesnath Nicholson, a lone witness to the growing desperation of the poor as successive years of the Great Famine took its frightening toll, stopped to rest her blistered feet. She leant against a wall and thought about the advice her friends had given her in America. They told her the trip was reckless and she would damage her health. Yet even at that moment she asked herself: Would she rather be back in her parlour in New York? The boarding house thrived, the marriage did not. But now Nicholson became more concerned about the mental and physical state of the Irish emigrants who were arriving in increasing numbers. She decided to go to Ireland to learn more about the reasons for this suffering. Her plan was to walk through the country, distribute Bibles to the poor, and read the Bible to those who could not read. She believed this would be a source of comfort. Innocently, and alone, at the age of 52, she arrived in Ireland in May 1844. Dressed in a polka coat, bonnet and India rubber boots, and carrying an enormous black bearskin muff, from which she produced tracts from the Bible and Bibles themselves, she must have been an extraordinary sight. She boldly set forth, and for two years walked the length and breadth of the country. From the beginning her mission was difficult. Catholic people regarded Bible readers as proselyters, while the Protestant missionaries rejected Nicholson’s democratic ideas. But she quickly grasped the urgency of the growing disaster. She hits out at those in authority for failing to do more. Her targets include the British government, relief officials, and absentee landlords. She extends her criticisms to those who were seen to be helping, including clergymen (especially the well fed ones ), a ladies relief committee in Dublin, whom she believed to be self-serving, unlike the hard working ladies of Belfast. Even the Quakers were chastised for distributing corn in ‘expensive sacks’. She set to bear witness to the suffering, visiting the poor and encouraging the relief workers. She not only recorded their names, but described some of the selfless people who died probably from famine fever caught while working among the poor. Rev Patrick Pounden, the rector of Westport, and his wife; and Rev Francis Kinkaid, the Church of Ireland curate of Ballina, who died on January 28 1847. She invited both Catholics and Protestants to contribute to a plaque to commemorate them on the church wall. Nicholson did not see the visitation of the Great Famine as a punishment from God, as many government officials did; but judged it a ‘man-made disaster’. She denied the old lie that the Irish poor were lazy. They simply lacked work. Nicholson, however, was not impressed. She had seen the reality of the emigrant’s lot in the slums of New York. Ignorance and lack of English kept many idle and unemployed. Next week: Feeding children in the Great Famine. NOTES: * Nicholson wrote two accounts of her visits to Ireland: Ireland’s Welcome to the Stranger, an excursion through Ireland in 1844 and 1845 (originally published 1847 ), and Annals of the Famine in Ireland in 1847, 1848 and 1849 (1851 ), now reprinted by The Lilliput Press, edited by Maureen Murphy. **Hedge schools declined with the introduction of the national school system in the 1830s. (Sources for this week’s Diary include Asenath Nicholson and School children in Ireland, by Maureen Murphy, published in Women and the Great Hunger, Quinnipiac University, USA. On sale €25 ).